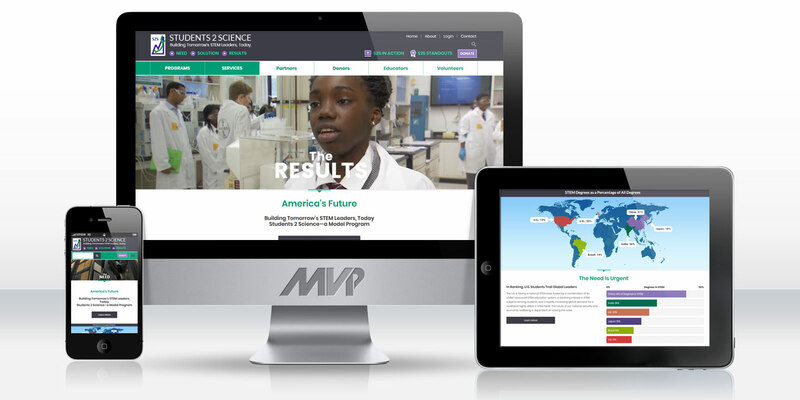 MVP developed this custom responsive website with extensive CRM features for Students 2 Science (S2S) in 2017. S2S is a small non-profit organization that is devoted to expanding the number of students in the US that choose to study STEM fields after high school—especially those in underserved communities. The new responsive website is loaded with high definition video and photographs taken from actual S2S classes. The homepage begins with a student testimonial, includes a map of the US’s relative underperformance in producing STEM majors, shows looping video of experiments in the lab, and concludes with additional video testimonials. S2S’s corporate sponsors’ logos appear at the bottom throughout the website, showing in random order on a scroll. Secondary presentation pages are filled with quotes, stats, and photos communicating major topics around STEM education in the US today. The core content is divided into the four audiences that interact with S2S, and the programs and services it offers. The entire site is built on a Content Management System (CMS) that allows the client to add and update information as they see fit. The website also features extensive Customer Relationship Management (CRM) features that facilitate the creation and coordination of new S2S events. Classes can sign up for available dates for either the on-site ISAAC program, or the Virtual Laboratory, which uses online audio and video to facilitate S2S coursework remotely across the country. Student and school information is stored for each class, and volunteers register to be reviewed and assigned to specific programs per their skills, interests, and availability. Automated emails are generated to inform administrators when new registrations have signed up, and to inform volunteers and classes when their registrations are confirmed. Class rosters can be accessed and specially designed name tags for students and volunteers generated from these rosters and associated event information. The platform also stores information on past, present, and future donors. A dynamic query system allows administrators to retrieve virtually any combination of stored data filtered by time period to generate reports on S2S operations. The new website has dramatically improved the organization’s online presence, while the advanced custom CRM features allow the organization to manage all its core business operations from one convenient online location.